With social share buttons installed on nearly 2 billion sites, you might think people use them all the time. You would be wrong. Naytev has found that people use share buttons about as much as they click display ads. 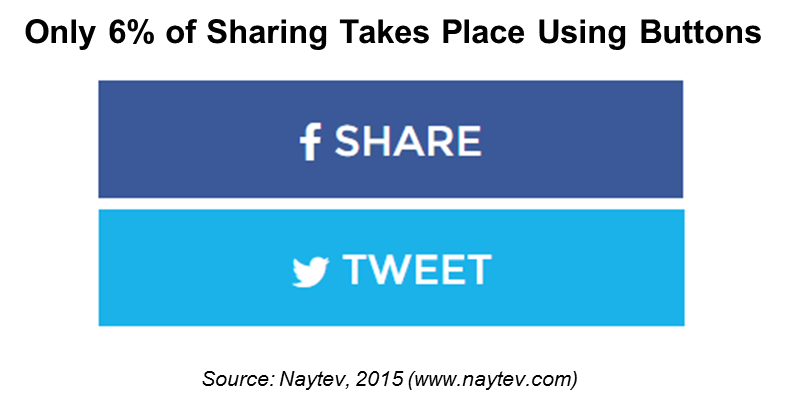 Naytev has found that only about 6% social sharing takes place via share buttons. This is not a limited phenomenon; we analyzed over 1 million Facebook and Twitter shares across top websites that use Naytev to optimize their content engagement. Here’s an insider secret – 80% to 90% of people share content with their social networks manually, by copying a URL and pasting it directly as an update. 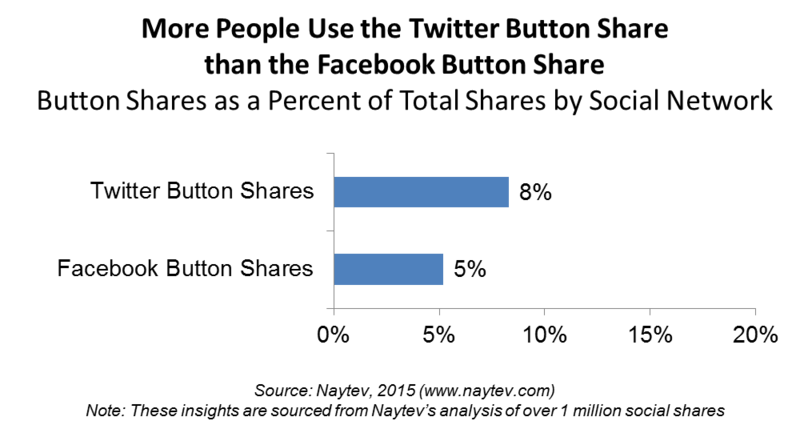 The remaining 5-10% share via mobile browsers, news readers (e.g. Feedly), and internally on Facebook. Note: We focus on Facebook and Twitter as part of this analysis. 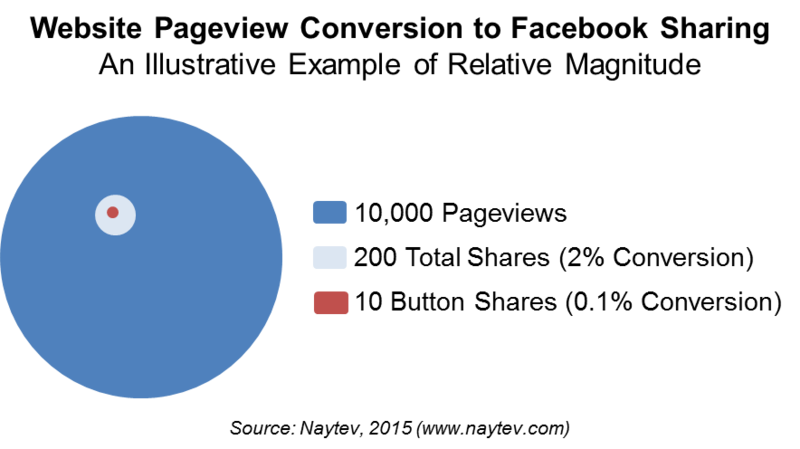 In aggregate, these networks account for 85%+ of shares on the major sites Naytev works with. Let’s consider the implications of low share button use for an article that gets 10,000 pageviews. If 2% of those pageviews convert to Facebook shares, you would get 200 shares. Of those 200 Facebook shares, 10 might be button shares. Thus, only 0.10% of traffic used the article’s Facebook share button. This clickthrough rate is in the same low range as what you commonly see when running a display ad campaign. You may wonder how share button use can be so low, despite button visual prevalence and indicators of engagement. Visual indicators can be misleading. For example, Facebook share counts rarely tell you the actual number of shares – it is common practice for these counts to aggregate many types of social engagement. In contrast, Twitter counts reflect just Tweets (i.e. “Favorites” are not included). For Facebook, the share count typically reflects the sum of shares, comments, and likes. 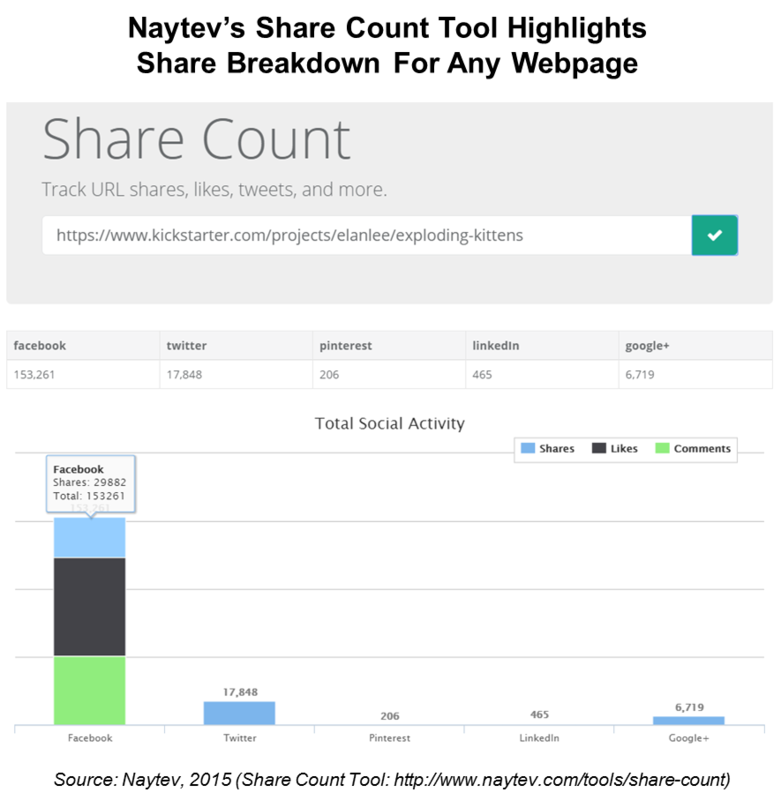 Likes normally represent the majority of the “share” activity in these counts, which can make it difficult to tell how many actual shares took place. 5.4% of Facebook shares take place via buttons, while 8.2% of Tweets take place via buttons. Furthermore, we found that the use of Facebook share buttons is steady across the sites we assessed, but the use of Tweet button can spike, occasionally clearing 20%. These spikes are often correlated with sites that often produce viral content and use very conspicuous share buttons. We explore button display in our post, 7 Share Button Techniques To Boost Your Website on Social. The greater use of Tweet buttons can be explained by differences in sharing between Twitter and Facebook. If you paste a link into your Facebook feed, your post will auto populate with rich media, achieving the same result as if you used the Facebook share button – there’s no need for you to write anything. However, if you paste the same link into your Twitter feed, the Tweet will not auto-populate with content. Sometimes Twitter will import a rich media Twitter card for your post after it goes live, but the card only occasionally shows by default. This means the Twitter button is more valuable to a page visitor than copy/pasting a link into Twitter. 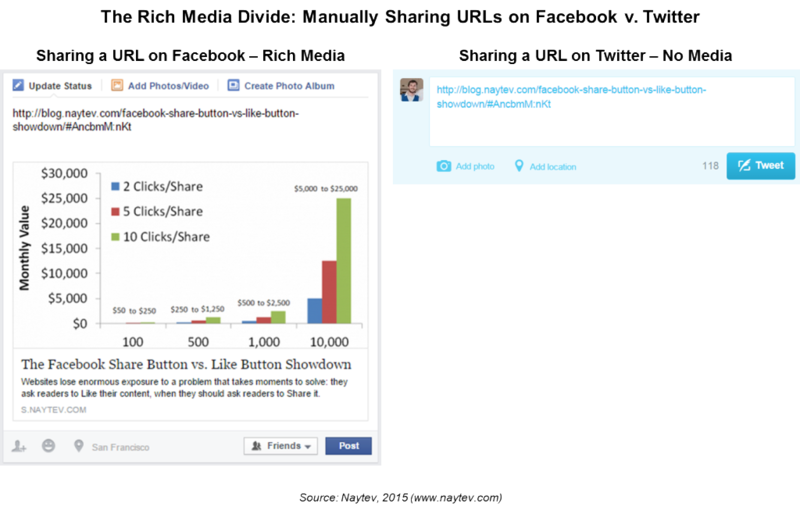 Share buttons provide a great visual call to action for your page visitors to share your content. Share buttons lower the sharing hurdle – they’re intuitive and easy to use. Paired with share counts, share buttons can build credibility and cultural capital for your brand. Twitter share buttons provide your readers with default Tweet text to work with. Next week we’ll cover common share button pitfalls to avoid, like how to structure your share buttons so they don’t slow down your page load time. We’ll also cover button placement best practices that can boost your conversion from pageviews to shares.